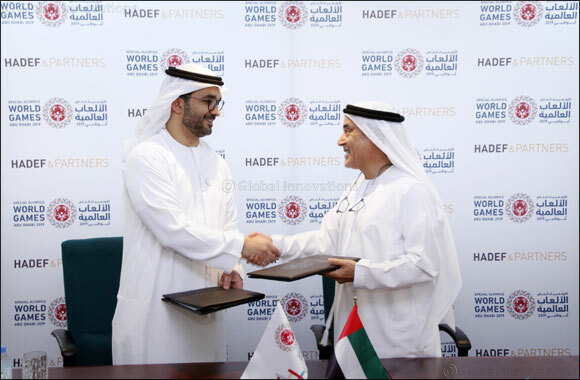 Dubai, UAE, January 16, 2019: Leading UAE law firm, Hadef & Partners has signed a Memorandum of Understanding to become the official legal supporter of Special Olympics World Games Abu Dhabi 2019. The agreement will see almost 100 of Hadef & Partners’ highly-experienced lawyers from the UAE, Middle East and international arena provide legal advisory services from their Abu Dhabi and Dubai offices in the build-up to, during and after the World Games. Hamad Al Zaabi, Senior Director of Business Support at Special Olympics World Games Abu Dhabi 2019, said: “We are very grateful to have Hadef & Partners on board with us as the official legal supporter of Special Olympics World Games Abu Dhabi 2019. Dr Faraj Ahnish, Managing Partner of Hadef & Partners, added: “We are extremely proud of our history, heritage and reputation as a dedicated UAE law firm and when we saw the opportunity to become involved, we did not hesitate. Hamad Al Zaabi, Senior Director of Business Support at Special Olympics World Games Abu Dhabi 2019 and Dr Faraj Ahnish, Managing Partner of Hadef & Partners.